Learn the basics about working with clients in Studio Ninja. Note: All clients are subscribed by default when added to the database manually or via the import feature. Search: Start typing in the search field and your list will dynamically start filtering your search criteria. View: Click the 'View' button to visit the Client Profile page. Here you will find more information about each client including invoices, jobs, emails and notes relating to each client. 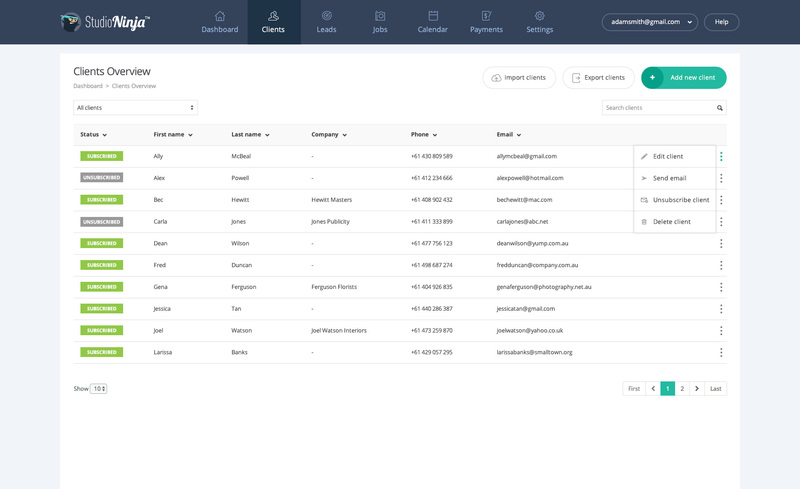 Sort: You can sort your clients by Subscription Status, First name, Last name, Phone and Email by clicking on the column title that you wish to sort by. Filter: You can filter your clients by All, Subscribed, or Unsubscribed clients. Export Clients: Click the 'Export Clients' button to quickly export all your current clients out of Studio Ninja into a CSV file.